Claire and Steve Ball - Owners Johnco Productions. Johnco Productions has taken out the Business Technology Initiative Award for utilising technology to improve and streamline warehouse efficiency and overall business output. Steve and Claire Ball came across Johnco in 2017, when founders and brothers Stephen and Brett Johnco were retiring. Claire says that when she and Steve saw that the well-established Johnco business was for sale, it met all their requirements. 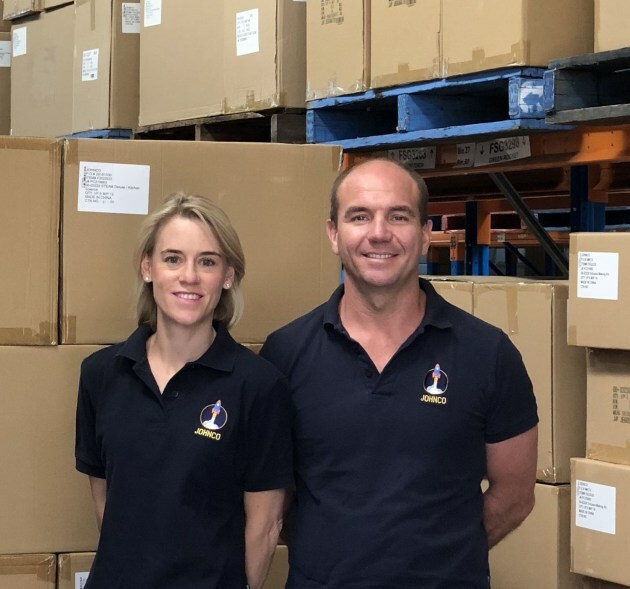 “We had been looking for a wholesale, distribution-type business in the toy industry space and this business for us, seemed to tick all the boxes in terms of having all the things that a business we were looking for required. “We were really looking for an opportunity where we could make some impact and change, and Johnco, with its strong foundations, was an obvious choice. Upon buying the business, both Claire and Steve saw that there was room to improve the technology within the business by further streamlining processes to increase efficiency. This implementation of technology across many facets of the business to improve and revamp it, is what ticked all the criteria boxes in the Business Excellence Awards. “So, for us, we took a lot of time in the first year to really understand the business, to improve technologies, to improve the back-end of the business, which obviously then converts to better customer service and a better working environment for our staff,” Ball says. “Before, the systems were very much stand-alone systems, so the website didn't talk to the inventory, payroll was managed offline and the bank accounts did not talk to the accounting software – a lot of it was a manual driven process. “So by implementing a new cloud based inventory management system, it was much easier to follow stock management, it was much easier to work on what product we need to be selling more of, what we weren't selling, it gave us a lot of information and we could access it anywhere, anytime. Claire and Steve Ball - Owners, Johnco Productions. Claire says that improving the look, feel and user-friendliness of the Johnco website also allowed retailers to place orders through the online portal at their leisure, ultimately boosting business for Johnco. “We firmly believe that people these days are busy enough in their shops and they want the ability to just be able to simply order at any time at their leisure and have a good platform to order from and a smart, easy checkout and be done with it. “What we've seen by creating a new website is the number of orders received by the website has gone up considerably from our customer base due the flexibility offered. “[Now] we're able to track orders much easier because the systems all talk to each other. We can look at stock in the warehouse 24/7 and also it speeds stock to customer due to increased efficiencies. Meeting other people within the Australian toy industry and receiving the 2018 Educational Toy of the Year Award.